It’s getting quite tiresome to see the blatant mischaracterizations and outright lies used by the media to portray Christians in a negative light. The “no gays allowed” viral story after the Supreme Court ruling on the Masterpiece Cakeshop is the latest in a string of dubious reporting that amounted to little more than hollow virtue signaling. Christians are one of, if not the, most generous groups of people the planet has ever seen – yet somehow they always seem to find themselves on the receiving end of some absurd media narrative that looks nothing like real-life. So how – and why – does this happen? >The Supreme Court ruled in favor of Christian baker Jack Phillips, who was sued for not baking a cake meant to celebrate a gay marriage. >Social media launched into paranoia mode, claiming a wave of Christian hate was about to be unleashed because Christians would feel emboldened to do what they allegedly desire most: oppress gay people. >The media dredged up a guy who went viral in 2015 for posting a “no gays allowed” sign in the window of his business. One (idiotic) guy. 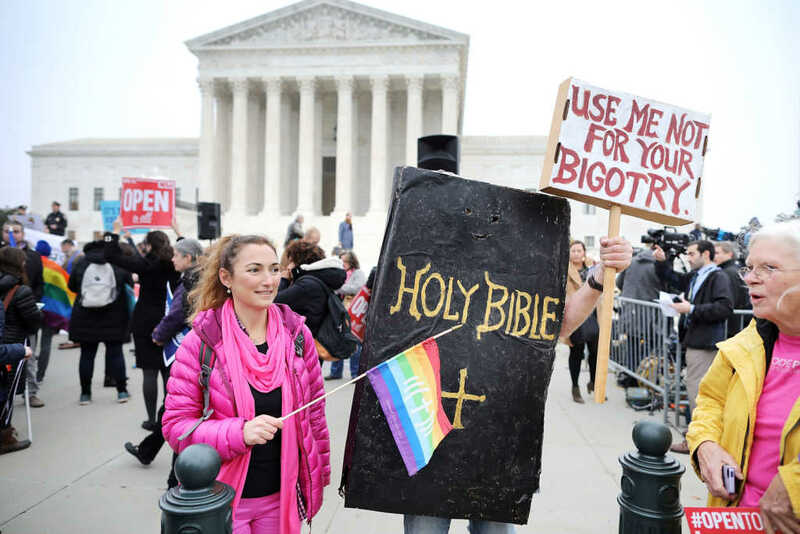 >After the 2018 SCOTUS ruling, “no gays allowed” guy put the sign back up. >Media IMMEDIATELY rushes back to this (one idiotic guy) and made him the poster child for Christian business owners again. And a narrative is born. We could have 500 Antifa protesters among 5,000 throwing molotov cocktails and setting things on fire, but it’s a total party foul to label the group violent. Christians get one guy putting up a horrible sign and he’s the standard bearer. It was never about cake. Let’s be clear – this guy acted inappropriately and not in a Christ-like manner. I have been a Christian for over 20 years and have not ever personally met any Christian who would approve of doing something as idiotic and childish as putting a sign in a shop window that says “no gays allowed.” It’s not representative of how Christ would treat a group of people. It’s awful, period. Christians are welcoming, not shunning. Christians may disagree with culture at large, but we are loving, not hateful. Christians also understand we are not perfect. That’s the whole point of Christianity – we admit our flaws, we make mistakes. We seek forgiveness. These are the kinds of stories the media should be pursuing as well as the ONE guy who has a horrible sign in his window. But they don’t have a balanced view – instead, the media goes to great lengths to find an extreme outlier and make them the standard bearer. That outlier is then run it into the ground, and, before long, it is known fact that Christians everywhere are putting signs in the windows of their businesses to refusing to serve gays. A very similar pattern unfolded with the Westboro Baptist Church. The media constantly reported on them and made them a household name (still does), yet they are literally just one crazy family posing as a “church” in a community. Again, no Christian I am aware of ever has supported anything even remotely close to what they were doing, these actions are not what Christian churches preach on a weekly basis, they contradict what the Bible teachers —yet there was the media, dutifully calling them out for their hateful “Christian” beliefs. It’s not even real! It’s a hypothetical scenario — and a very unlikely hypothetical scenario at that. How many people cater their wedding with pizza? This hypothetical scenario immediately turned into the “proof” that Pence’s laws would cause extreme persecution for gay people. What happened next was a flood of hatred came pouring into Memories Pizza’s Yelp page and a record 7,000+ bogus reviews had to be deleted. A GoFundMe campaign was launched to help the shop, raising a substantial amount of money. The danger with social media today, especially one controlled by two major conglomerates with a very one-sided worldview, is that many people just scan the headlines in their feeds and that’s where it ends. No discernment is used to judge the stories, the sources, and what actually is going on. And those headlines and narratives do nothing but paint Christians in a generally negative light. Christians have to be aware of this fact, look for stories and articles that don’t prop up this false narrative, and do our part to demonstrate that while we may disagree on things such as gay marriage, abortion, and more – we can still get along at the end of the day. Seek out media, journalists, commentators, and others who understand this dynamic. Support voices who understand it is possible to love someone and disagree with them. If we don’t, the media will continue to find ways to paint their severely distorted picture of Christianity, and it will only become harder and harder to openly express our views and practice our faith.